D E Magro, Mrs M Bolzon & P F Saunders. FACE VALUE (AUS) (2000). 4 wins-3 at 2, VRC Bobbie Lewis H., Gr.3. Sire of 226 rnrs, 129 wnrs, inc. SW Silent Surround (SAJC Sires' Produce S., Gr.3), Hidden Value, Great Scott, SP Ashlee Marie, Monica Kate and of Sadaqa, Heza Bargain, Dream Face, Good Value, Gambler's Girl, etc. Sire of the dams of SW Silent Command and of Picture Me Rolling, Sicario, Chicago Typewriter, Sapphire Miss, Exalted Maxine, Exalted Glory, Vabanque, Mi Bel Fio, etc. Arctic Blaze (f. by Face Value). 3 wins. See below. Prime Ruler (Francis Bacon). 7 wins to 1200m, A$136,510, SAJC Bicentennial Man H., MVRC BMW Sprint H., TROA Trophy H., SAJC Living Health H., Sunday H., SA Bookmakers H., Dairy Vale Ice Coffee H., 2d SAJC Durbridge S., L, Dhaulagiri H., Billson & Sawley Club Architects H., 3d SAJC Dermody S., Gr.3, Malaysia Airlines S., L, M Kokubunji Flying H., Chicago H., Grange Hotel H., 4th SAJC Durbridge S., L.
Saturday's Child. 6 wins to 1400m, 3d SAJC Schweppes H.
Prime Monarch. 2 wins at 1600m, 2000m, SAJC Fairmont Homes P.
Arctic Cash. 2 wins. See above. Sip Ja Goon. 2 wins at 1200m, 1700m in Korea. Blue is Beautiful (And Behold). 8 wins-3 at 2-to 1400m, WATC Graduation S.-4 times, 2d WATC Breeders' Champion S., L, Raconteur S., L.
Andiamo Lad - Happy Wonderland (Mac.). 10 wins-1 at 2-from 1000m to 1800m in NZ and Macau, Macau Grundy H., Chairman's Challenge Cup, Byerley Turk H., Paeroa H., Louviers H., 4th WRC Wakefield Challenge S., Gr.3. CENTURY (Better Boy). Third on The 1971-72 Aust. 2YO Free H. 11 wins-5 at 2-from 1000m to 1600m, A$169,930, VRC Sires' Produce S., Gr.1, Newmarket H., Gr.1, Craven A S., Gr.1, Lightning S., Gr.2, Ascot Vale S., Gr.2, MVRC Freeway S., Gr.2, Moonee Valley S., Gr.2, 2d AJC Doncaster H., Gr.1, All-Aged S., Gr.1, VATC Caulfield Guineas, Gr.1, Oakleigh P., Gr.1, Blue Diamond S., Gr.1, Toorak H., Gr.1, 3d VRC Craven A S., Gr.1. Champion sire. TAKE ADVANTAGE (Adayoun). Winner at 2, VRC Maribyrnong Trial S., L.
Ishkoodah (Rousseau). 9 wins-3 at 2-to 1200m, BATC 2YO H., 2d VRC Maribyrnong Trial S., L, 3d AJC Fernhill H., L.
TOY IMAGE (Noble Bijou). 6 wins from 1200m to 2450m, A$116,455, SAJC Eagle Blue S., Gr.3, VATC City of Springvale H., Galway Highweight H., TROA H.
LUCKY DIVA (Perugino). 11 wins-3 at 2-to 1200m, A$569,700, MRC Hyderabad Race Club S., Gr.3, 2d MRC Mannerism S., Gr.3, Bletchingly S., Gr.3, 3d MRC Hyderabad Race Club S., Gr.3. Producer. SPIRIT OF WESTBURY (Sir Tristram). 5 wins from 1100m to 2200m, A$518,090, Qld Tatt's RC Tattersall's Cup, Gr.3, 2d VRC Saab H., Gr.2, Queen Elizabeth S., Gr.2, 3d AJC Sydney Cup, Gr.1. GINA LOLLAWITCHA (Perugino). 3 wins at 1000m, 1200m, A$161,940, MRC Kevin Hayes S., L, Ian Miller H. Producer. LUCKY TYCOON (Last Tycoon). 6 wins-1 at 2-to 1550m in Aust. and Singapore, Singapore TC Silver Cup, L, Class 1 H.
SECRET STATUS (King Cugat). 2 wins-1 at 2-at 1050m, 1100m, A$121,500, SAJC Pewsey Vale S., L, 3d SAJC Dequetteville S., L. Producer. CATECHUCHU (Catbird). 5 wins-1 at 2-from 1200m to 1600m, A$645,062, WATC Champion Fillies S., Gr.3, MRC Mannerism S., Gr.3, 2d VRC AV Kewney S., Gr.2, 3d STC Magic Night S., Gr.2. Producer. ROYAL VOYAGE (Danehill). 6 wins from 1000m to 1800m, A$358,050, VATC St George S., Gr.2, VRC Paris Lane S., L, 2d VRC Blamey S., Gr.2, Carbine Club S., Gr.3, VATC Sandown S., Gr.3, Mercedes-Benz S., L, STC Sky High S., L, 3d VATC Schweppes Cup, L.
HOUTZEN (I Am Invincible). 7 wins-4 at 2-to 1200m, A$2,012,525, to 2018-19, ATC PJ Bell S., Gr.3, MVRC Champagne S., Gr.3, 2d MVRC Ian McEwen S., Gr.2, 3d MVRC Ian McEwen S., Gr.2. SHAMROCK SHORE (Song of Tara). 4 wins from 1900m to 2400m, A$264,420, City Tattersall's Club Cup, L, 2d QTC Brisbane Cup, Gr.1. FOUARDEE (Forest Glow). 8 wins-1 at 2-to 1400m, A$534,540, AJC Bill Ritchie H., Gr.3, STC Concorde S., Gr.3, 2d STC Theo Marks H., Gr.2, 3d AJC Hobartville S., Gr.2. Sire. SOJUSTREMEMBERTHIS (Flying Spur). 4 wins to 1400m, A$206,050, VRC Chubb S., L, 2d VRC Moomba P., L. Producer. MY VEGAS (Royal Academy). 7 wins to 1200m, A$323,070, STC Starlight S., L, 3d Gosford RC Takeover Target S., L.
MOLOKAI PRINCE (Biscay). 3 wins at 2, A$614,530, AJC Breeders' P., Gr.3, 2d Queensland Guineas, Gr.2, 3d VRC Linlithgow S., Gr.2, STC Todman Slipper Trial S., Gr.2. Sire. FLAK JACKET (Rubiton). 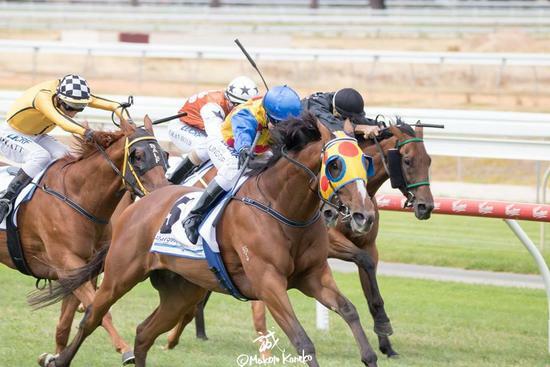 6 wins from 1550m to 2050m, A$396,190, MVRC Alister Clark S., Gr.2, VRC Sutcliffe S., L, VATC Permastall P., Snowhite Cleaning H., Yarra Glen Cup, 2d VATC Lord S., L, Mornington Cup, L, 3d STC Premiere S., Gr.2. MAUNATRICE (Keltrice). 9 wins from 1200m to 2500m, A$264,249, SAJC Port Adelaide Cup, L, 2d SAJC Lord Reims S., Gr.3. Producer. BALLET SUITE (High Chaparral). 4 wins from 1400m to 2000m, A$193,375, BRC Princess S., L, 3d MVRC Tesio S., Gr.3. CASQUETS (Fastnet Rock). Winner at 2, A$78,260, VRC Talindert S., L, 3d MVRC Sportingbet 2YO P.
SEASIDE BANK (Sikorsky). 10 wins from 1200m to 1600m, 21,350, 1,101,922Rgt., S$196,278 in Malaysia and Singapore, Selangor TC Piala Emas Sultan Selangor, L, Penang Sprint Trophy, L.
3 wins at 1200m to 2018-19 in Aust.